Matt Osborne joined the University of Toronto in 2013. Prior to joining Toronto, he worked as a research economist at the U.S. Bureau of Economic Analysis and the Antitrust Division of the U.S. Department of Justice. While in government Matt’s work involved measuring the contribution of R&D to U.S. economic output, and review of mergers and firm conduct for anticompetitive effects. Matt holds a Ph.D. in economics from Stanford University and a B.A. in mathematics and economics from University of Western Ontario. 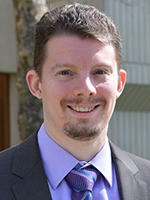 Matt’s research involves estimating empirical models of firm and consumer behavior and using those models to make predictions about the effects of business strategy and policy. He has written papers about consumer learning about new products, consumer choice of cellular phone tariffs and the effect of bill shock regulation, and consumer stockpiling behavior. He has also conducted research on business to business pricing in markets where geographic differentiation that arises due to transport costs plays a role.